Not surprisingly, The Kraken Black Spiced Rum has a thing about the colour black. Last year they held a Black Christmas Tree pop-up, and now they're hosting a Black Christmas Dinner, for three nights only, on 5th - 7th December 2016, at Beagle in Geffrye Street, E2. Expect Black beef, black pudding stuffing, black carrots, black potatoes and more (none of it burnt, it's just black) - plus a black spiced Chritmas pud to finish, and lots of Kraken cocktails. Tickets are just £25, and you can also book spaces at the bar for the evenings, if you just want to enjoy the cocktails and the vibe. 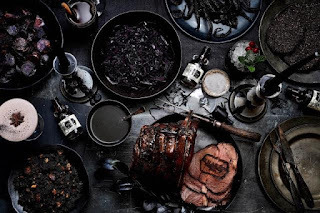 "A new pop-up Christmas experience launching this December is promising a mouth-watering dark twist on the ideal festive meal: the world’s first ever all-black Christmas feast. A rich, dark Christmas spirit will embrace diners as they sit at lavishly decorated banqueting benches, surrounded by black Christmas trees, gifts and wreaths. A dreamlike gentle snowfall will drift down towards guests from within the restaurant’s high arches throughout; a spectacular effect created by Olivier award-winning lighting designers magically completing the surreal experience. Tickets to the Kraken Black Christmas, which are available for £25 from Billetto [https://billetto.co.uk/events/the-kraken-black-christmas] also include three free delectable dark cocktails, which have been specially created for the occasion. Inspired by The Kraken Black Spiced Rum and all the magic, tastes and smells Christmas has to offer - with a Kraken twist using ingredients like activated charcoal, squid ink and toasted black sesame seeds: the Kraken Black Blitzen includes black forest liqueur and cranberry sauce for that Christmassy taste. The Kraken Midnight Frost Bite is filled with orange liqueur, lime juice and squid ink, creating a deep black cocktail and the Kraken It’s Cold Outside, a hot mulled cider with a Christmas twist – black charcoal. Also included in the ticket price is a wrapped gift for every guest to take home. For those seeking to dip their toe in the darkly magical Christmas world of The Kraken but unable to stay for dinner, there are tickets to the Kraken Rum bar, also available via Billetto, which is open from 4pm until midnight each night. Bartenders will be serving up the festive Kraken cocktails for £5 each, and a selection of deadly delicious nibbles including nori chips, black pudding croquettes with black garlic mayo and black sesame macaroons. More information about gaining entry can be found on The Kraken twitter page @TheKrakenRum_UK using #KrakenXmas." Tickets - £25 + fees from Billetto here - or free for access to the bar.